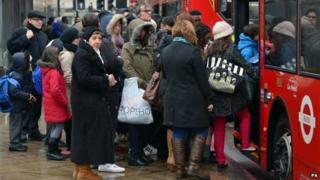 Two strikes planned by London bus drivers have been postponed. Drivers were set to walk out on Friday and next Monday, in protest over the way pay differs across the city's 18 bus companies. The Unite union wants to set up a forum with all of the bus companies to discuss how it can end pay disparities and improve working conditions. Transport for London says it continues to urge the union and bus companies to meet individually. Drivers held a 28-hour strike last week over the same disagreement. It says pay differences between companies can see salaries vary from £17,000 to £25,000 but TfL said aligning wages across the board could cost up to £100m a year. Unite said it had postponed the strikes as an "act of goodwill" and called on the bus companies to hold talks at conciliatory service Acas. It added that were this not to happen, the strikes would be back on. Regional officer, Wayne King, said: "They have a duty to London's 6.8 million bus passengers, to join us in collective talks to end the pay inequality and pay chaos on London's buses. "All we are asking for is a collective forum to discuss how we can end pay disparities, over a sensible timeframe." The union also said TfL had been "interfering" in the dispute "in an unlawful manner". "We urge TfL to start playing a constructive role and sign a public statement of neutrality to confirm that operators can negotiate freely with Unite," he added. Leon Daniels, TfL's managing director of surface transport, "categorically refuted" Unite's claims, insisting the organisation had not asked bus companies to sign a confidentiality agreement. Labour member on the London Assembly, Val Shawcross, said: "By suspending the bus strikes planned for this Friday and Monday, Unite have shown they are serious about finding a settlement. "Given the depth of public disruption caused by the previous bus strikes it is in everyone's interest that all parties get round the table. "If the mayor doesn't get stuck in and help facilitate this, Londoners will question why he is once again absent on an issue of this importance."